Leading one of the Best Interior Design Firms in the Bay Area. Company owner and principal designer, Carol Christenson has been helping San Francisco and Bay Area clients beautify their homes for over 25 years. A graduate of University of Washington with a BA in Design/Clothing, Textiles & Art, she has worked with several prominent local designers, and ultimately founded her own interior design firm in 1994. She has been featured in the Contra Costa County Designer Showcase, and been published both locally and nationally. 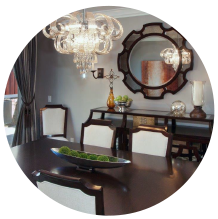 Carol is an experienced professional in the field and is a Certified Interior Designer #6480 in the state of California and serves the East Bay Area and San Francisco. Her interior design firm can guide you in making custom decorating choices which reflect your personal decorating taste while working within your budget and time frame. Owner of Studio 6 Design, her new showroom is now open. Carol invites you to come & view her sophisticated and unique furnishings. Our interior design firm offers full service design and consultation. Carol oversees each custom designed project, from the preliminary blueprint stage, working with the contractors, specifying materials and furnishings, to the final completion of the job. 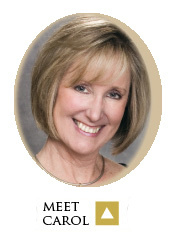 Her client’s think highly of her work as a Bay Area interior decorator. The Right Tools. The Right Source. Visit our design showroom located on North Main Street in Walnut Creek. Browse furniture galleries, sit on the upholstery, touch and feel fabrics and textures. From floor to ceiling our showroom is filled with furnishings, art & accessories, custom window coverings, bedding, area rugs, and “wow” walls commissioned by local artists. As a Hunter Douglas Priority Dealer, we showcase their window coverings in large working displays so you can visualize each product in your home. Browse through thousands of fabrics in our showroom library. View fabrics for custom upholstery, custom drapery window treatments, or a custom bedding ensemble. Our showroom is connected with Distinctive Cabinetry. The professional's source for custom cabinetry. With a wide range of suppliers to choose from, we work within your budget to design and install quality cabinetry for any room in your home. Our sophisticated design program helps you visualize the project in 3D! Come see our many and varied cabinet displays. Why Work with First Impressions Interior Design? Expert painters & upholsterers are but a few of the resources that we can provide, without having to find them through trial and error. Professional home interior designers know what is in the market and where to find what you are looking for to fit your needs. Our company works with many manufacturers, suppliers & trade professionals which translate to significant savings for our clients.